The final days of the Lazax Empire began in the seventy-third year of the Twilight Wars, when without warning, the Federation of Sol led a deadly assault directly on Mecatol Rex, the capital planet of the empire itself. A climactic struggle for control of the imperial city followed, fought as much with diplomacy and deception as with troops and starships. This is the story of that struggle. Rex: Final Days of an Empire is a board game of negotiation, betrayal, and warfare in which 3–6 players take control of great interstellar civilizations, competing for dominance of the galaxy’s crumbling imperial city. 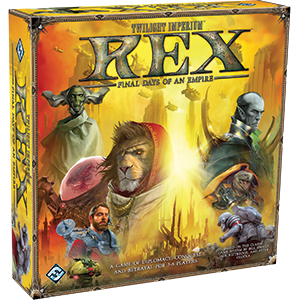 Set 3,000 years before the events of Twilight Imperium, Rex tells the story of the last days of the Lazax empire, while presenting players with compelling asymmetrical racial abilities and exciting opportunities for diplomacy, deception, and tactical mastery.